Just south of Ancona rises the solitary limestone peak of Monte Conero whose steep slopes slide down to the sea and the prettiest beaches on the whole of the Northern Adriatic shore. The beauty of the place means that its three small resorts offer standing room only in July and August; come in late May, early September or, best of all, June. 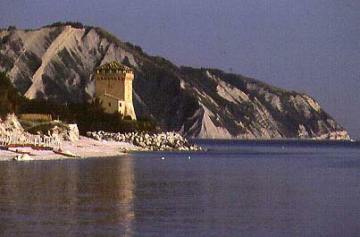 From Ancona, the first port of call is Portonovo, the smallest retreat on the Conero Riviera. Gasp at the picture postcard views out to sea as you wind down the dead-end road to this collection of hotels, restaurants, campsites and makeshift beach huts on a narrow strip of beach. The strand is split in two by the Fortino Napoleonico, a squat, blank-eyed fort built in 1808 by Napoleon's Italian Viceroy to fight off English ships. It is now a most singular hotel. At the end of the road, where the evergreen oaks that smother the mountain come down to the sea, stands the early Romanesque church of Santa Maria. Built between 1034 and 1048, its curious form is unique in Italy and looks as if it might be more at home in Normandy. Back on the main road, the Conero trail skirts the base of the mountain with sweeping views inland. Around 8 km S from the junction for Portonovo, follow signs for Monte Conero to drive up to Badia di San Pietro, built in the 12thC as a Benedictine Hermitage and now a hotel. This is the highest point on the mountain reachable by car and worth the journey for the views. The whole area was declared a regional nature park in 1987 and a web of signed footpaths cover the peak - maps and information from the Consorzio del Parco del Conero at Sirolo. On the summit (572 mt) traces of a Paleolithic settlement dating back 100,000 years have been discovered - the earliest signs of human presence in the region. 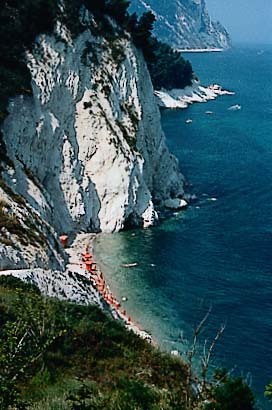 The southern spur of Conero shelters the riviera's two chief resorts. Sirolo is the most attractive, with a spruce medieval centre and a tree-lined, balcony piazza that teeters high above the sea. The best beaches are accessible using a half-hourly bus service that drops down to each of the coves. The mass of campsites and hotels below the old town runs seamlessly into more of the same at Numana. Still, it has a fine long beach to the south and an archeological museum documenting the history of the Piceni tribes who lived here until Rome muscled in (Via La Fenice, 4). To escape from the crowds make for one of the many small isolated coves only reachable by boat - regular services in season from Numana, Sirolo and Portonovo. Sirolo also boasts the Conero Golf Club, the region's fine course for golfers.